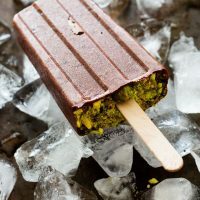 Chocolate Cherry Pistachio Paletas can fit within almost any diet since they are gluten-free, dairy-free and vegan. We have been focused on eating much healthier since Boxing Day and we’ve been doing pretty well overall. It has been a really great opportunity to try new foods and get out of the fast-food trap. We are lazy by nature (hence, the focus on easy and mostly blender made recipes here!) so we will always default for something that takes minutes and a handful of ingredients over something long in the making and fussy. These vegan paletas fit the bill. I love paletas and ice pops. They bring me back to my childhood when one summer we ate something like 500 popsicles while trying to earn enough points to earn a “free” Nintendo game. The points were etched into the sticks and ranged from 10-500. By the time we had enough points and sent them in we were heartbroken to get burned by the “while supplies last” clause. No heartbreak here though unless you aren’t quick enough to grab one of these paletas before your kids eat them all. Just 6 ingredients and 5 minutes of active prep and these are ready for the freezer. I blend these up easily in my Vitamix which takes care of those frozen bananas in no time. Now, the hard part is always the waiting. Luckily these only take an hour or two to get firm so you can make these just before you start dinner and still enjoy an evening treat. Better yet, make a big batch, stock up and you can enjoy these on demand. 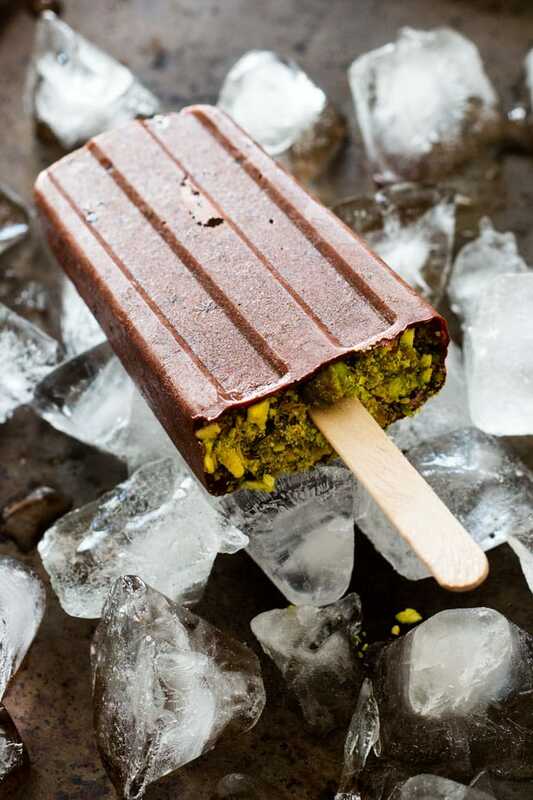 Chocolate cherry pistachio paletas are just one more reason why I like the warmer weather. Don’t be fooled though – I would eat these all year round. I am a sucker for paletas and ice cream. Looking for something a little less sweet? Try these Coconut Blackberry Lime Paletas. 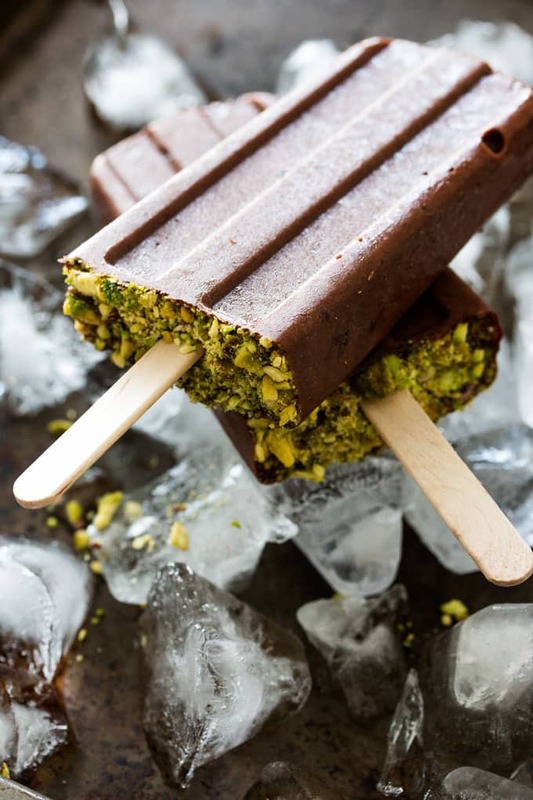 Chocolate Cherry Pistachio Paletas are a gluten-free, dairy-free, vegan treat that takes only 6 ingredients + 5 minutes of active prep. Add first 4 ingredients to blender jar. Secure lid and blender starting on low variable speed and increasing to high speed. Use your tamper to push ingredients toward the blades. Once well mixed, add cherries and pulse until well mixed. Fill your ice pop molds and gently tap molds on hard surface to remove air bubbles. Blend or chop pistachios. 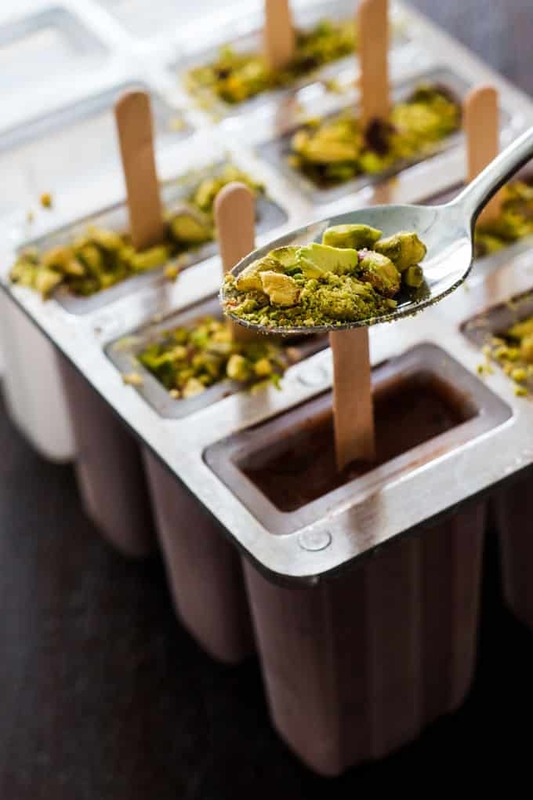 Top each mold with pistachios and the place in the freezer for at least 1-2 hours. I’m always on the hunt for new dairy-free treats and these are so pretty and look delicious. Nice work! Thanks so much. We love making paletas because there are limitless combinations and it is really easy to make them dairy free. I love pistachios– and the ingredients in here are perfect! Thanks Michelle. I’m totally jumping on the pistachio bandwagon. They are now one of my fave treats. That is just one winning triple flavor combo! Such a decadent treat! Yes bring on summer and all the fun cold treats. These look totally delicious. Love the end topping. Chocolate and cherry are such a great combination too. Thanks Gloria. I always look forward to the summer so I can start making all these fun recipes. They seems like a “cheat” treat! Even better that they are guilt free!! Just the way we like them . Guilt free treats are the best.